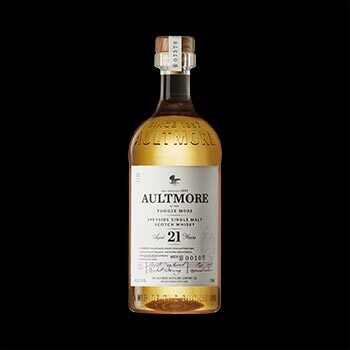 Released in November 2015 Bacardi Global Travel Retail launched the Aultmore 21 Year Old, a Speyside single malt Scotch whisky as an exclusive contract through World Duty Free Group stores for one year. As part of this contract there are two travel retail exclusives, a 12YO and a 21YO – Bacardi see this rare Speyside single malt release as an integral part of putting Bacardi on the whisky map. 9 years older than the 12 year old entry level , the 21 year old is limited and only available as travel retail, through World Duty Free Groupm and like all the bottlings in the Aultmore whisky range it is bottled at 46% ABV, non-chill filtered and takes its colour naturally from the re-fill hogsheads casks it slowly matured in for 21 years. There’s a big difference in age between the two travel retail bottlings, this is where I’ll find out just how much of a difference age makes to this range. The vanilla is at forefront with this whisky, it’s gentle with cloudy homemade apple juice, fresh red apples and the smallest touch of lime zest. It’s full of fresh grassy notes, and gentle meadow flowers, with a touch of moorland heather and malted cereal notes, with delicate rosemary notes in the background. It’s rich but fresh, with frequent notes of sweet honey and powdered milk. Soft and buttery, freshly baked shortbread topped with crunchy granulated sugar. The apples from the nose are soft on the palate, so soft it would be easy to overlook them but they come through hand in hand with poached pear and add a delicate refined orchard note. Ripe honeydew melon brings out further sweetness alongside a yeasty banana note. There’s a dash of nutmeg which brings out the vanilla, with honey adding a further layer of sweetness. Sun warmed hay and malted cereal, with homemade custard tarts, with the custard and pastry combining with crushed pecans adding a subtle nuttiness which really adds depth. This is oily yet light. This really needs the oiliness of the whisky to encourage the full range of flavours through. It’s very delicate, however do not mistake that for bland or insipid, as it could not be further from the truth. The vanilla is comforting and plays the lead in this, but as the finish lingers on the grassy notes from the nose come back into play, and the delicious malt notes start to appear and linger on. Grown up and incredibly balanced, you need to give it some time to truly open up, but it’s more than worthwhile. Once you have unlocked the secrets to this whisky, you wont want to put it down.